Although I’m embarrassed to admit it, Amouage’s handcrafted bottles first interested me in the brand, and I assumed that as much care went into creating the fragrances as their opulent containers. The first perfume I tried, Lyric for Women, lived up to my expectations, and my Amouage perfume oils are as complex, unique and every bit as luxurious as those first gold-encrusted bottles. It was therefore with great excitement that I encountered Honour for Woman at the Elements Showcase. Honor is named in honor of “truth and beauty” and is meant to be an elegy to Madame Butterfly as she is remembered by her grown son. White on white butterfly wings flit across the box and the white ceramic bottle reflects the purity of Butterfly’s heart. Honour for Women is a soft white floral that seems more commercial and conventional than the other Amouage fragrances with which I’m familiar. Pepper and carnation give it the tiniest bit of a kick, frankincense and amber add warmth and luster, and the sweetness of lily of the valley and jasmine permeate the blend. However gardenia and tuberose, whose mintiness adds a touch of cool detachment, are the star performers. Lovers of white florals should definitely attend the performance but those who expect uniqueness and inventiveness from Amouage may be disappointed. Honour Man has strong notes of pepper, nutmeg and geranium – it’s opening is sharp and lively. I was surprised to read that tonka bean is one of the basenotes- on me the drydown is all dry woods and herbs (cedar, frankincense and patchouli). The perfume didn’t develop much and after a while I found myself feeling irritated by its piquancy. If you like the scent of feisty pepper and arid woods you might enjoy this parched fragrance, but if your significant other wears it I hope his heart is warmer than his perfume. Honour EDP is available in 50 and 100 ml bottles. Was discussing on the Posse how I am not quite woman enough to wear Amouage! And I probably couldn't manage this one, especially, with the Butterfly reference....breaks my heart every time I try and listen to it. I love this design. Someone finally did something different with a fragrance bottle. Yours is the fourth review I am reading on this scent. Marian, I am still waiting impatiently to try this one, I think it's probably "me" even though it's not in my budget right now! I love Amouage's big perfumes, but it would be nice to have one that's a little softer and more subtle. Tammy- I was food shopping and one of the famous arias came over the speakers. I almost cried in front of the vegetable bins. 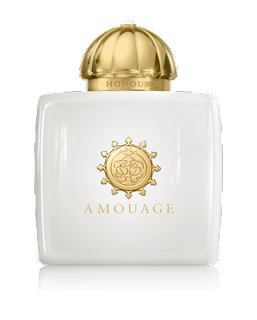 Even though Amouage tried to put a positive spin on the story by choosing the name Honour, I wouldn't be able to get the tragedy out of my mind every time I wore it. Eula_W- The packaging is very tasteful and elegant. I especially like the austerity of the bottle. Mr Lonely- A smile on such a gray day is most welcome!